Thousands of Canadians were moved by Testaments of Honour. Now, with A Soldier’s View, Blake Heathcote opens his extensive archive of photos, rarely before published or seen, to share with us the face of the Second World War as it was witnessed by those who fought it. Blake Heathcote has spent years crisscrossing the country, interviewing Canadian war veterans on video so that their stories will be preserved for generations to come. 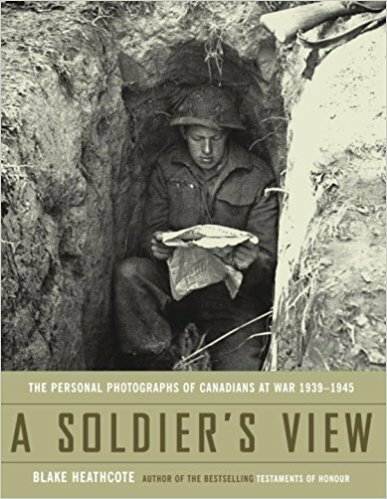 In the course of these interviews he has compiled an archive of more than 8,700 photographs digitally scanned from the personal collections of the men and women he has met, veterans who were involved in all branches of the service and on all fronts of the war. Pipers, possibly of the 48th Highlanders of Canada, playing in the streets of Campobasso, Italy, 18 October 1943.